A cool little Calypso tune to whisk you away on Friday as you start to unwind from the work week, by George Symonette. When I came across this double 7″ gatefold sleeve that was completely blank on the inside I thought it was quite strange. So from what I understand, back in the day when you would take a cruise ship to the Bahamas performers like George Symonette were the hired acts and passengers would get these free goodies and you could have them sign the inside of the blank gatefold. Any excuse to release a double 7″ gatefold is fine by me. Happy #45Friday! Some records are just near impossible to find in good condition. They are usually the ones with universal appeal that cameo’d at house parties on the regular and were repeatedly played until needle burned. They include the likes of Bob Marley, Jimmie Hendrix, and Tito Puente and need no introduction or courtship. 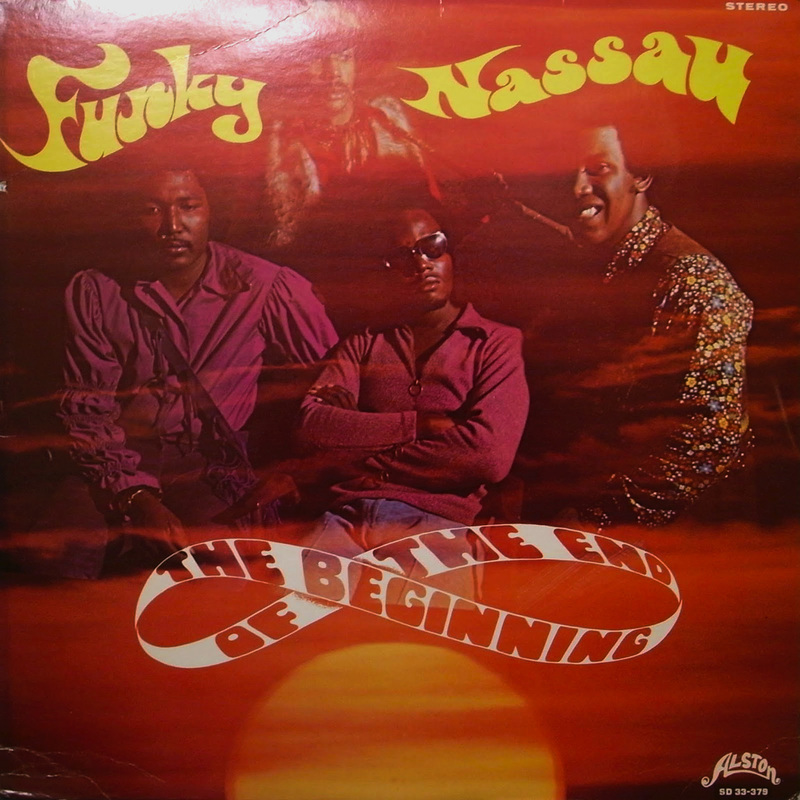 The Beginning Of The End, a family island soul and funk band from Nassau may not have the same appeal as the above mentioned legends, but you’ll definitely have a tough time finding any of their material in even decent condition. It is with bittersweetness that I announce that after 10+ years I finally got my hands on playable original copy of this wish-list record (without playing inflated ebay prices). Every song is playable except for the title track and my favorite island funk bomb – Funky Nassau, which rests right on top of a prominent heat warp. Fortunately this billboard chart topper was a huge hit at home in the Bahamas, the UK, and in USA and was pressed on 45 and widely distributed so I have a pair to flip when necessary. So why was a record with such a hit and so groundbreaking for the region so difficult to find in album form? Your guess is as good as mine. Even without the blockbuster Funky Nassau the album still holds it’s place as one of the most solid all-around island soul-funk albums to ever be recorded. I know I’m not alone in my thinking either. Just about every song on this album as been sampled by beatmakers, covered by bands, and played by DJs all over the globe. Please join me as I listen to The Beginning Of The End for the fifth time today! In the spirit of the holiday season and Junkanoo parties around the world I share with you an incredible interview with the legendary Bahamian musician Raphael Munnings (posted on Youtube by the man himself! ), who breaks down his families rich musical and political history, the unprecedented musical feats of his band The Beginning Of The End, and of course their jumping Junkanoo roots. Rather than bump my gums, I’ll let Ray speak for himself. Be sure to check all fours clips in sequential order, as some heavy history is dropped chronologically. Take it away Ray!